Multidrug resistance proteins (MRPs) are members of the “C” branch of the ATP-binding cassette transporter superfamily. Human MRP1 transports a wide range of natural product drugs and structurally diverse conjugated and unconjugated organic anions. Its closest relative is MRP3. Despite their structural similarity, the homologs differ substantially in their substrate specificity. 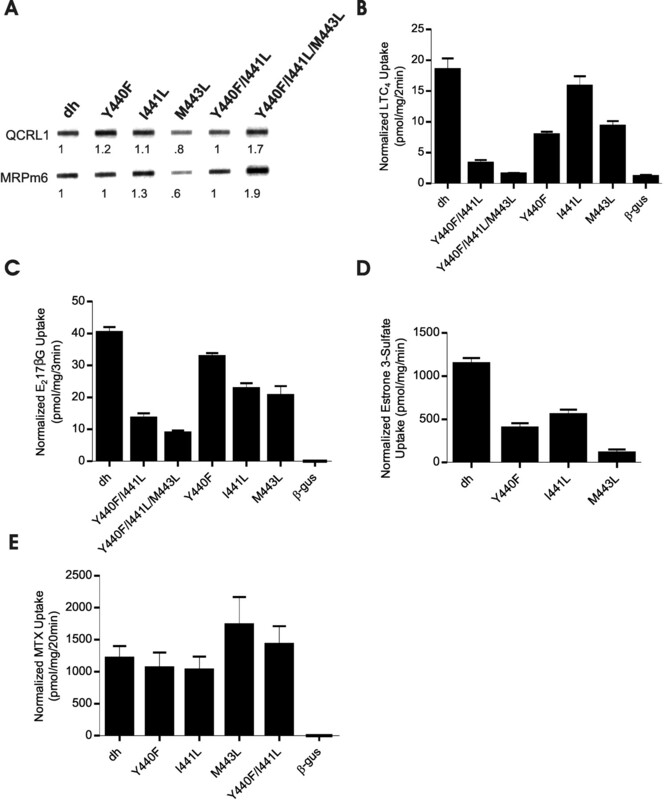 It is noteworthy that MRP1 transports glutathione (GSH) and GSH conjugates and displays GSH-stimulated transport of a number of unconjugated and conjugated compounds. In contrast, MRP3 does not transport GSH and is a poor transporter of GSH conjugates. However, both proteins transport glucuronide conjugates, such as 17β-estradiol 17-(β-d-glucuronide). We have constructed a series of MRP1/MRP3 hybrids and used them to identify a region of MRP1 that is critical for binding and transport of GSH conjugates such as leukotriene C4 (LTC4). Substitution of this region encompassing transmembrane helices 8 and 9 and portions of cytoplasmic loops 4 and 5 of MRP1 with the equivalent region of MRP3 eliminated LTC4 transport. Transport of other substrates was either unaffected or enhanced. We identified three residues in this region: Tyr440, Ile441, and Met443, mutation of which differentially affected transport. It is noteworthy that substitution of Tyr440 with Phe, as found in MRP3, reduced LTC4 and GSH-stimulated estrone-3-sulfate transport without affecting transport of other substrates tested. The mutation increased the Km for LTC4 5-fold and substantially reduced photolabeling of MRP1 by both [3H]LTC4 and the GSH derivative, azidophenacyl-[35S]GSH. These results suggest that Tyr440 makes a major contribution to recognition of GSH and the GSH moiety of conjugates such as LTC4. The ATP-binding cassette (ABC) transporter, multidrug resistance protein (MRP) 1 was identified in a human small cell lung cancer cell line, H69AR, that exhibited cross-resistance to a broad range of natural product-type drugs (Cole et al., 1992). MRP1 was highly overexpressed in H69AR cells and after gene transfer studies was shown to cause a multidrug resistance phenotype (Cole et al., 1994; Grant et al., 1994). MRP1 has since been found to be expressed in many solid tumors and hematological malignancies, and MRP1 is a negative prognostic indicator of treatment outcome in some (Deeley et al., 2006). In vitro, MRP1 confers resistance to many structurally and functionally diverse natural product chemotherapeutic agents, including anthracyclines, Vinca alkaloids, and epipodophyllotoxins. MRP1 also actively transports a range of glutathione (GSH)-, glucuronide-, and sulfate-conjugated organic anions (Deeley et al., 2006). The GSH-conjugated, cysteinyl leukotriene C4 (LTC4) is the best characterized physiological substrate of MRP1 (Leier et al., 1994; Loe et al., 1996b). Other potential physiological substrates include the peptides, GSH and oxidized GSH, the glucuronide conjugate 17β-estradiol 17-(β-d-glucuronide) (E217βG), and the steroid sulfate estrone 3-sulfate (E13SO4) (Leier et al., 1994, 1996; Loe et al., 1996a; Qian et al., 2001b). MRP1 also transports chemotherapeutic agents to which it confers resistance, such as methotrexate (MTX), vincristine, daunorubicin, and etoposide (VP-16) (Loe et al., 1996b; Rappa et al., 1997; Hooijberg et al., 1999; Renes et al., 1999). Transport of certain substrates, both unconjugated (e.g., vincristine and VP-16) and conjugated (e.g., E13SO4), is stimulated by GSH (Loe et al., 1996b, 1998; Sakamoto et al., 1999; Qian et al., 2001b; Zelcer et al., 2003). In some cases (e.g., vincristine), the GSH-dependent substrate may reciprocally stimulate GSH transport, whereas in others (e.g., E13SO4)no stimulation is observed (Loe et al., 1998; Qian et al., 2001b). MRP1 is a member of the “C” branch of the ABC superfamily, which includes the cystic fibrosis transmembrane conductance regulator (ABCC7), the two sulfonylurea receptors (SUR1/ABCC8, SUR2/ABCC9), and eight other MRP1-related proteins (ABCC2–6 and 10–12/MRP2–6 and 7–9). Most ABC transporters are made up of two membrane spanning domains (MSDs), each composed of six transmembrane (TM) helices and two cytosolic nucleotide binding domains (NBDs). 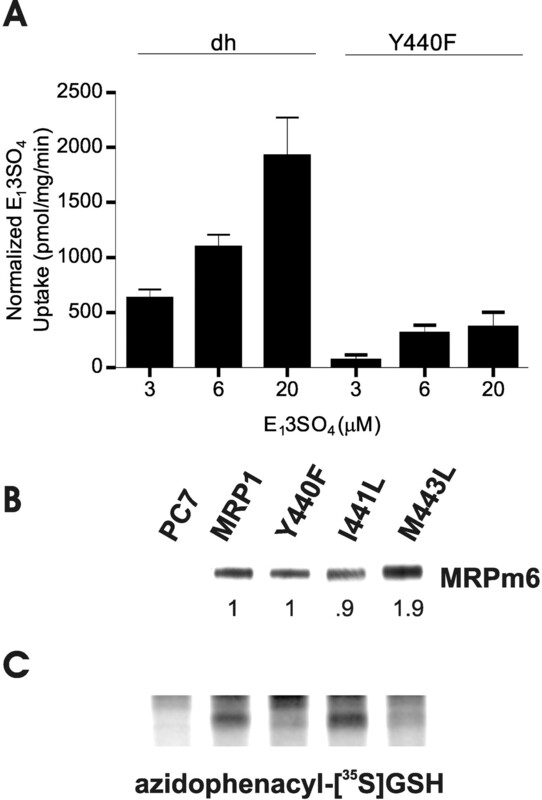 However, MRP1, MRP2, MRP3, MRP6, and MRP7 and the two sulfonylurea receptors (SURs) have an additional relatively poorly conserved MSD, MSD0, which contains five TM helices and a glycosylated extracellular NH2-terminal region (Deeley et al., 2006). MRP1 is most closely related to MRP3 (58% identity), whereas the protein's substrate specificity is most similar to that of MRP2 (49% identity). MRP3 differs from MRP1 and MRP2 in both its drug resistance and conjugated anion transport profiles (Deeley et al., 2006). Like MRP1 and MRP2, MRP3 confers resistance to epipodophyllotoxins, such as VP-16, but not to Vinca alkaloids or anthracyclines (Kool et al., 1999; Zelcer et al., 2001; Zhang et al., 2003). MRP3 also transports certain glucuronide conjugates, including E217βG, that are MRP1 and MRP2 substrates, as well as other compounds that are not transported by the other two proteins (Hirohashi et al., 2000; Zeng et al., 2000; Zelcer et al., 2001; Zhang et al., 2003). Unlike MRP1 and MRP2, MRP3 does not transport GSH, and the efficiency with which it transports GSH conjugates, such as LTC4, is low (Zeng et al., 2000; Zelcer et al., 2001). Site-directed mutagenesis studies have identified a number of residues that are either critical for overall activity or influence the substrate specificity of MRP1, but few have been identified that selectively affect transport of GSH conjugates, such as LTC4 (reviewed in Deeley et al., 2006). Two notable exceptions are Lys332 and His335 in TM6. Certain mutations of both residues reduce LTC4 and apigenin-stimulated GSH transport without affecting transport of other MRP1 substrates, such as E217βG or MTX (Haimeur et al., 2002, 2004). However, these studies have also shown that it is not possible to predict structure/substrate specificity relationships based on amino acid sequence conservation among MRP homologs, and that mutation of even exceptionally conserved amino acids can differentially and selectively affect the transport of shared substrates such as E217βG (reviewed in Deeley et al., 2006). In the present study, we have used MRP1/MRP3 hybrid proteins to screen for regions, rather than individual amino acids, of MRP1 that are important for the transport of LTC4 and other GSH conjugates as a first step toward locating the critical residues involved. Using MRP1/MRP3 hybrids that covered all the MSD1 and MSD2, a region of MRP1 that includes TMs 8 and 9 (amino acids 425–516) was located, which, when replaced with amino acids 411 to 502 of MRP3, completely eliminated LTC4 transport while modestly enhancing transport of E217βG. Within this region there are 26 amino acids that differ between the two proteins; among them we were able to identify a cluster of three residues in TM8, Tyr440, Ile441, and Met443 in MRP1 and Phe426, Leu427, and Leu429 in MRP3, which contributes significantly to this major difference in substrate specificity between the two proteins. Materials. [3H]LTC4 (165.7 Ci/mmol), [3H]E217βG (45 Ci/mmol), [3H]E13SO4 (57.3 Ci/mmol), and [35S]GSH (1498 Ci/mmol) were from PerkinElmer Life and Analytical Sciences (Waltham, MA), and [3H]MTX (28Ci/mmol) was from Moravek Biochemicals, Inc. (Brea, CA). Hygromycin, doxorubicin hydrochloride, VP-16, vincristine sulfate, S-methyl GSH, the unlabeled equivalents of the tritiated compounds, and the reagents for synthesis of azidophenacyl-[35S]GSH were purchased from Sigma-Aldrich (St. Louis, MO). Methotrexate was obtained from Faulding (Canada) Ltd. (Montreal, QC, Canada). Cell Lines and Tissue Culture. Human embryonic kidney (HEK) 293 cells were grown in Dulbecco's minimal essential medium plus 7.5% fetal bovine serum (Sigma-Aldrich) and Sf21 cells in Grace's medium supplemented with 0.2% tryptose broth and 10% fetal bovine serum (Sigma-Aldrich). The HEK293 cell line transfected with the pCEBV7 vector, with and without the MRP1 coding sequence (HEK-MRP1 and PC7, respectively), has been described previously (Cole et al., 1994). The mutant MRP1 cDNAs were also cloned into the pCEBV7 vector, and HEK293 cells were transfected using Fugene (Roche Applied Science, Laval, QC, Canada) according to the manufacturer's directions. After at least 2 weeks of selection in 100 μg/ml hygromycin, cloned cell lines were isolated by limiting dilution and tested for MRP1 expression. Wild-type MRP1 was expressed in Sf21 insect cells as two half-molecules, amino acids 1 to 932 and 932 to 1531, using the baculovirus expression vector pFASTBAC dual (Invitrogen, Carlsbad, CA) as described previously (Gao et al., 1996). Likewise, β-glucuronidase (β-gus) was expressed in Sf21 cells using the expression vector pFASTBAC. Both generation of recombinant bacmids and baculoviruses and the conditions for viral infection have also been described previously (Gao et al., 1996). Hybrid cDNA Construction and Site-Directed Mutagenesis. To generate the vectors expressing the hybrid MRP1/MRP3 proteins, the relevant portions of MRP3 were amplified by polymerase chain reaction (PCR) using oligonucleotide primers with the appropriate MRP1 restriction enzyme cleavage sites added to the 5′ ends. If the MRP3 fragment contained the cleavage site of choice, then a compatible cleavage site was used instead. After cleavage of both the PCR fragment(s) and the appropriate vector containing a portion of the MRP1 cDNA, the DNA fragments (two or three) were ligated together. The identity of each construct was confirmed by restriction enzyme digestion, and the fidelity of the PCR was checked by sequencing. Finally, the MRP1/MRP3 hybrid portion of the construct was moved into the pFASTBAC dual-MRP1 expression vector. To generate the vectors expressing the mutant MRP1 proteins, site-directed mutagenesis was performed using the QuikChange II Site-Directed Mutagenesis Kit (Stratagene, La Jolla, CA). The target sequence for the PCR was an approximately 2.7-kilobase 5′ end of MRP1 cDNA cloned into the pGEM3Zf+ vector (Fisher Scientific, Waltham, MA). After sequencing to ensure the fidelity of the PCR, the MRP1 fragment was cloned into pFASTBAC dual-containing wild-type MRP1, replacing the equivalent unmutated fragment. Likewise, a BglII fragment from the pFASTBAC dual clone containing the mutant MRP1 cDNAs was moved into the mammalian expression vector, pCEBV7-MRP1. Each construct was verified to be correct by both sequencing and restriction enzyme analysis. Determination of Relative MRP1 Protein Levels. Membrane vesicles were prepared from either Sf21 or HEK293 cells by nitrogen cavitation followed by layering on a 35% sucrose cushion as described previously (Loe et al., 1996b). Total membrane protein concentration was determined by Bradford assay (Bio-Rad, Mississauga, ON, Canada), and then serially diluted protein samples from each membrane preparation were analyzed either in SDS-polyacrylamide gel electrophoresis (PAGE), followed by electroblotting to Immobilon-P membranes (Millipore Corporation, Billerica, MA), or transferred to the same membrane using a Bio-dot SF microfiltration apparatus (Bio-Rad). In each case, the appropriate wild-type MRP1, either the full-length protein or protein expressed as two half-molecules, was included on each blot. The membranes were probed using anti-MRP1 monoclonal antibodies (mAbs) MRPm6, MRPr1 (Alexis Biochemicals, San Diego, CA), and QCRL-1 (Hipfner et al., 1996), and antibody binding was detected using horseradish peroxidase-conjugated goat anti-mouse or anti-rat IgG (Pierce Biotechnology, Rockford, IL), enhanced chemiluminescence detection, and X-Omat Blue XB-1 film (PerkinElmer Life and Analytical Sciences). Densitometry of the film images was performed using a ChemiImager 4000 (Alpha Innotech Corp., San Leandro, CA) or a ScanMaker i900 scanner (Microtek, Carson, CA) and Photoshop 5.5 software (Adobe Systems, Ottawa, ON, Canada). Either multiple blots or multiple exposures of the same blot were used to analyze the relative MRP1 protein levels. Expression of each protein was determined relative to wild-type MRP1, and the transport levels normalized accordingly. For proteins expressed as half-molecules, the levels of expression of each half-molecule compared with the equivalent wild-type fragment were determined. In some cases, the half-molecules of the mutant protein were expressed within ±10% of the wild-type fragments. In this case, no normalization was done. Where expression of the mutant protein differed more substantially, normalization was done using the expression levels of the least abundant half-molecule compared with its wild-type counterpart. Transport of 3H-Labeled Substrates into Membrane Vesicles. Plasma membrane vesicles were prepared as described previously, and ATP-dependent transport into inside-out membrane vesicles was measured using a rapid filtration technique (Loe et al., 1996b). LTC4 transport assays were performed at 23°C in a 20-μl reaction volume containing 2 to 4 μg of membrane vesicle protein, 50 nM [3H]LTC4 (20 nCi/reaction), 10 mM MgCl2, 4 mM ATP or AMP in transport buffer (250 mM sucrose, 50 mM Tris HCl, pH 7.5). ATP-dependent uptake was calculated by subtracting the uptake in the presence of AMP from the uptake measured in the presence of ATP. The results are expressed as mean ± S.D. of triplicate determinations in each assay. Uptake of [3H]E217βG was measured in a comparable fashion except that transport was measured at 37°C in a reaction containing 400 nM [3H]E217βG (40 nCi/reaction). [3H]MTX uptake was also measured at 37°C for 20 min in a reaction mixture containing 100 μM [3H]MTX (200 nCi/reaction). [3H]E13SO4 uptake was measured at 37°C at a final concentration of 6 μM [3H]E13SO4 (80 nCi/reaction) with the addition of 2 mM S-methyl GSH. Km and Vmax values of ATP-dependent [3H]LTC4 uptake in membrane vesicles (4 μg) were measured at six or seven LTC4 concentrations (25 nM to 1 μM) for 1 min at 23°C in transport buffer containing 4 mM AMP or ATP and 10 mM MgCl2. Data were analyzed using GraphPad Software Inc. (San Diego, CA) Prism software, and kinetic parameters were determined by linear regression analysis of a Hanes-Wolff plot. Likewise, initial rates of [3H]E13SO4 uptake were measured as described for LTC4 except that the assay was done at 37°C using a 30-s time point and concentrations of E13SO4 ranging from 3 to 20 μM as described above. Photoaffinity Labeling of Wild-Type and Mutant MRP1 Proteins with [3H]LTC4. Samples containing approximately equivalent levels of MRP1 protein were mixed in a 30-μl reaction volume, and an aliquot (2 μl) was removed. The remaining 28 μl was then mixed with [3H]LTC4 (200 nM, 0.13 μCi) and incubated for 30 min at room temperature. After freezing in liquid N2, samples were cross-linked at 302 nm for 1 min as described previously (Loe et al., 1996b). The freezing and cross-linking cycle was repeated nine more times. Both the cross-linked and native proteins (the 2-μl sample) were resolved by electrophoresis through 5 to 15% gradient SDS-polyacrylamide gels. The gel containing the cross-linked proteins was fixed, processed for fluorography by soaking in Amplify (GE Healthcare, Baie d'Urfé, QC, Canada), dried, and then exposed to film for approximately 2 weeks. The nonradioactive gel was processed as described for immunoblots above. Preparation of Azidophenacyl-[35S]GSH and Photolabeling of Wild-Type and Mutant MRP1 Proteins. Azidophenacyl-[35S]GSH was prepared essentially as described previously except that 100 μCi of [35S]GSH (1498 Ci/mmol) was diluted to approximately 500 Ci/mmol with cold GSH (Qian et al., 2002). For photolabeling, HEK293 membrane vesicles containing approximately equivalent amounts of wild-type or mutant MRP1 protein were mixed with membrane vesicles from the control cell line, PC7, such that each sample contained 120 μg of total membrane protein in 60 μl of transport buffer. A sample (4 μg) was taken before photolabeling for immunoblot analysis, as described for [3H]LTC4 photolabeling. Each sample was then incubated with 0.25 μCi of azidophenacyl-[35S]GSH at room temperature for 10 min and irradiated at 312 nm on ice for 5 min. The membrane vesicles were collected by centrifugation at 14,000 rpm for 15 min before solubilization in 50 mM Tris, pH 7.5, and Laemmli buffer. After resolving the proteins in 6% SDS-PAGE, the gel was treated with Amplify (GE Healthcare) for 20 min, dried, and exposed to film with an intensifying screen for up to 3 days. Chemosensitivity Testing. Drug resistance was determined using a colorimetric 3-(4,5-dimethylthiazol-2-yl)-2,5-diphenyl tetrazolium bromide assay as described previously (Cole et al., 1994). Mean values ± S.D. of quadruplicate determinations were plotted using GraphPad software. IC50 values were obtained from the best fit of the data to a sigmoidal curve. Relative resistance is expressed as the ratio of the IC50 values of cells expressing mutant or wild-type MRP1 compared with cells containing the empty expression vector. Resistance values were the average of three or more independent experiments. Identification of Regions in MRP1 and MRP3 Responsible for Differences in LTC4 Transport. Based on the relatively high amino acid sequence identity and similar predicted topology of MRP1 and MRP3 (Fig. 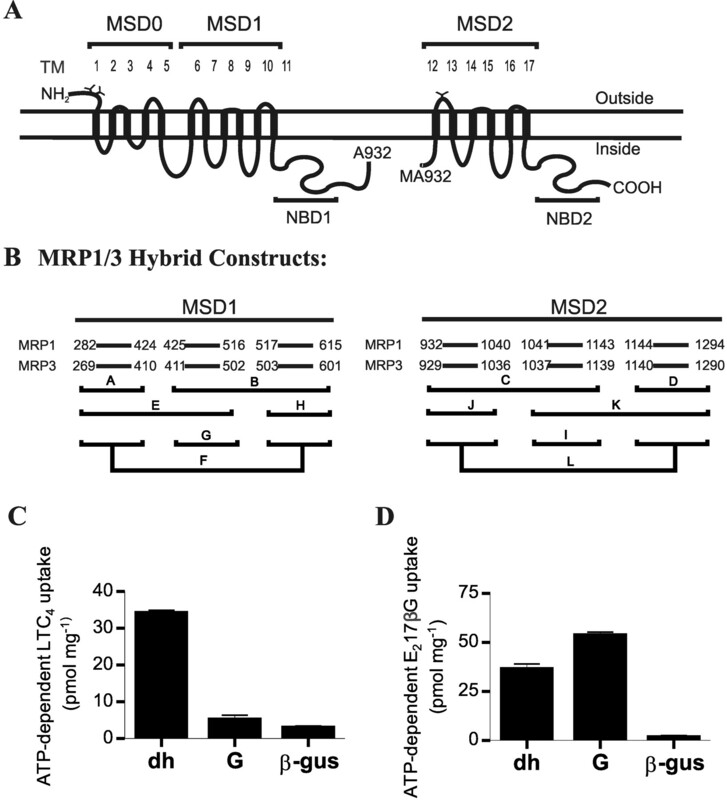 1A), 12 hybrid expression vectors were constructed such that limited regions of MSD1 and MSD2 of MRP1 were replaced with the predicted equivalent from MRP3 (Fig. 1B). Because we and others have shown previously that the MSD0 region of MRP1, defined here as amino acids 1 through 203, is not required for transport of a number of substrates, including LTC4, this region was not included in our analysis (Bakos et al., 1998; Westlake et al., 2003). Each hybrid protein was expressed in Sf21 cells as an NH2-terminal fragment of amino acids 1 through 932 and a COOH-terminal fragment of amino acids 932 through 1531 (Fig. 1B). When coexpressed, these two fragments of wild-type MRP1 associate correctly and support ATP-dependent LTC4 transport with an efficiency of approximately 90% compared with the intact protein (Gao et al., 2000). After preparation of membrane vesicles, the ability of each of the hybrid proteins to transport LTC4 and E217βG was compared (data not shown). None of the constructs supported LTC4 transport, with the notable exception of constructs C and J, which displayed transport activity similar to, or approximately 50% of, wild-type levels, respectively. Construct C contained four of the six TMs of MSD2 from MRP3 (TMs 12–15), whereas construct J contained only TMs 12 and 13 of MRP3. Neither of these constructs transported E217βG, nor did constructs A, E, F, H, K, and L, although a low level of transport was detected with constructs B, D, and I. The only construct that retained E217βG transport activity while losing the ability to transport LTC4 was construct G, in which amino acids 425 through 516 in MSD1 of MRP1 (TMs 8 and 9) were replaced with amino acids 411 through 502 of MRP3 (Fig. 1B). The G construct showed enhanced E217βG (Fig. 1D) transport compared with wild-type MRP1, whereas LTC4 transport was reduced to approximately 15% of wild-type levels (Fig. 1C). This observation, coupled with the ability to exchange four TMs of MSD2 of MRP1 for those of MRP3 without loss of LTC4 transport (construct C), strongly suggested that the region encompassing TMs 8 and 9 of MRP1 contained nonidentical residues that were critical for LTC4 binding and/or transport. To determine whether a smaller region of MRP1 could be exchanged with MRP3 and produce a similar effect on transport, hybrid constructs G1 (substitution of amino acids 425–477 of MRP1 with amino acids 411–463 of MRP3) and G2 (substitution of amino acids 478–516 of MRP1 with amino acids 464–502 of MRP3) were made (Fig. 2A), and the level of expression in Sf21 cells (Fig. 2B) and transport of LTC4 and E217βG were determined (Fig. 2, C and D). LTC4 transport by the G1 construct was approximately 40% of wild-type levels (Fig. 2C), whereas E217βG transport was 2 times the level obtained with wild-type MRP1 (Fig. 2D). For the G2 construct, LTC4 transport was reduced by 80% (Fig. 2C), but E217βG transport was similar to wild-type MRP1 (Fig. 2D). Thus, both halves of the G region contain residues that alone or in concert affect LTC4 transport by MRP1, whereas E217βG transport was either unchanged or enhanced by introduction of corresponding nonidentical amino acids from MRP3. Analysis of the Contribution of Nonidentical Amino Acids in the G Region of MRP1 and MRP3 to LTC4 and E217βG Transport. The results obtained with the hybrid proteins indicated that multiple residues throughout this region could contribute to interactions with LTC4. Within the G region, there are 26 amino acid differences between MRP1 and MRP3 (Fig. 2A). Using site-directed mutagenesis, we attempted to identify those nonidentical amino acids that had a major and selective effect on LTC4 transport. Each of the 26 nonidentical amino acids in MRP3 was introduced into MRP1, either as single residue substitutions or as double substitutions where adjacent residues were involved. Constructs were expressed in Sf21 cells, and after determining their expression levels (Fig. 3A), LTC4 and E217βG transport was assessed for each mutant protein. In a preliminary screen based on single time point assays, the majority of individual, single mutations had negligible effect on LTC4 transport (data not shown). The most dramatic reduction in transport was found for one double mutation located in the G1 region, Y440F/I441L, which reduced LTC4 transport to less than 20% of wild-type levels (Fig. 3B). However, this double mutation also decreased E217βG transport to approximately 25% of wild-type MRP1 (Fig. 3C). A second double mutation, A481G/V482A, located in the G2 region also reduced LTC4 transport by 6-fold, and in this case, E217βG transport was reduced to approximately one third of wild-type MRP1 levels (data not shown). Predicted topology of human MRP1 and location of the MRP3 segments that were exchanged in the MRP1/MRP3 hybrid proteins. A, the predicted topology of human MRP1 with 17 TM helices, organized into three MSDs and two NBDs. Also depicted is the site of division of the protein used for expression as two half-molecules: MRP11–932 and MRP1932–1531. B, portions of MSD1 and MSD2 of MRP1 that were exchanged for the equivalent regions of MRP3 (fragments A–L) and expressed as MRP1/MRP3 hybrid proteins in the Sf21 expression system, as described in the text. ATP-dependent LTC4 (C) and E217βG (D). Transport by membrane vesicles expressing wild-type MRP1 (dh), the MRP11–425MRP3411–502MRP1517–1531 hybrid protein (G), and vesicles expressing a control protein β-gus. Shown are transport levels obtained at 2 min for LTC4 and at 3 min for E217βG. Conditions used for the transport assays were as described under Materials and Methods. The results shown are the averages and S.D. of triplicate assays from a typical experiment. Similar results were obtained with a second set of independently produced membrane vesicle preparations. Because no single- or double-substituted mutant was found that alone explained the dramatic reduction in LTC4 transport by the G hybrid protein while leaving E217βG transport intact, a series of multiple mutations were made predominantly targeting clusters of nonidentical amino acids (Table 1). With the exception of one triple mutation, in which substitution of M443 with L was introduced into the LTC4 transport-deficient Y440F/I441L double mutant, no combination of mutations tested reduced LTC4 transport by more than 60 to 70% (data not shown). The Y440F/I441L/M443L virtually eliminated LTC4 transport (Fig. 3B) but also reduced E217βG transport by approximately 80% (Fig. 3C). MRP1 dh constructs containing multiple mutations from the G region To generate the vectors expressing the mutant MRP1 proteins, site-directed mutagenesis was performed using the QuikChange II Site-Directed Mutagenesis Kit (Stratagene), as described under Materials and Methods. Each construct was verified to be correct by both sequencing and restriction enzyme analysis. Transport of LTC4, E217βG, E13SO4, and MTX by Y440F, I441L, and M443L MRP1 Mutant Proteins. To further characterize the effects of the double and triple mutations on substrate specificity, we investigated the influence of individual contributing amino acid substitutions on transport of LTC4 and E217βG, as well as two additional substrates, E13SO4 and MTX. These two organic anion substrates were chosen because the former is transported by MRP1 in a GSH- (or S-methyl GSH-) stimulated manner but is not a substrate for MRP3, whereas MTX is transported by both proteins (Deeley et al., 2006). Partial sequence alignment and ATP-dependent [3H]LTC4 and [3H]E217βG uptake by membrane vesicles containing wild-type MRP1 or MRP1/MRP3 hybrid proteins G1 and G2. A, top, sequence alignment of the “G” region of human MRP1 (amino acids 425–516) and the corresponding region of MRP3 (amino acids 411–502). The corresponding region of MRP3 was determined by aligning the amino acid sequences of all the ABCC family members. In the alignment shown, identical residues are indicated by colons, whereas residues that differ between MRP1 and MRP3 are in boldface type. The sequences of the G1 and G2 regions are depicted on separate lines of the figure. Bottom, sequence alignment of the regions of all the MRPs corresponding to amino acids 425 to 463 of MRP1 generated as described above. Critical residues described in the text are underlined. B, immunoblot of an SDS-PAGE gel loaded with 1 μg of total membrane vesicle protein per lane from Sf21 cells expressing wild-type or G1 and G2 hybrid proteins probed with mAb MRPr1 or MRPm6, which recognize the NH2-terminal fragment, amino acids 1 through 932, and the COOH-terminal fragment, amino acids 932 through 1531, of MRP1, respectively. Densitometry of the blot indicated that levels of the hybrid proteins were very similar to that of wild-type MRP. The procedures used for immunoblotting and densitometry were as described under Materials and Methods. Consequently, no adjustment of [3H]LTC4 and [3H]E217βG uptake to compensate for differences in expression was done. C and D, ATP-dependent uptake of [3H]LTC4 (50 nM, 23°C, 3 min) and [3H]E217βG (400 nM, 37°C, 5 min). The results shown are the mean ± S.D. of triplicate determinations in a single experiment. Similar results were obtained with a second set of independently produced membrane vesicle preparations. The Y440F and M443L mutations each independently decreased initial rates of LTC4 transport by approximately 60 and 50%, respectively, whereas the I441L mutation had little or no effect (Fig. 3B). In contrast, E217βG transport was decreased approximately 50% by both the I441L and M443L mutations but only 20% by the Y440F mutation (Fig. 3C). All three mutations significantly decreased E13SO4 transport in the presence of 2 mM S-methyl GSH, with the Y440F, I441L, and M443L mutations reducing transport at 1 min by approximately 65, 50, and 90%, respectively (Fig. 3D). However, none of the single mutations or the double mutation had a statistically significant effect on transport of the common MRP1/MRP3 substrate MTX (Fig. 3E). Thus, mutation of each of these three amino acids differentially affects substrate specificity as opposed to overall transport activity, strongly suggesting that they are not simply perturbing the conformation of the protein and that they contribute to substrate recognition. 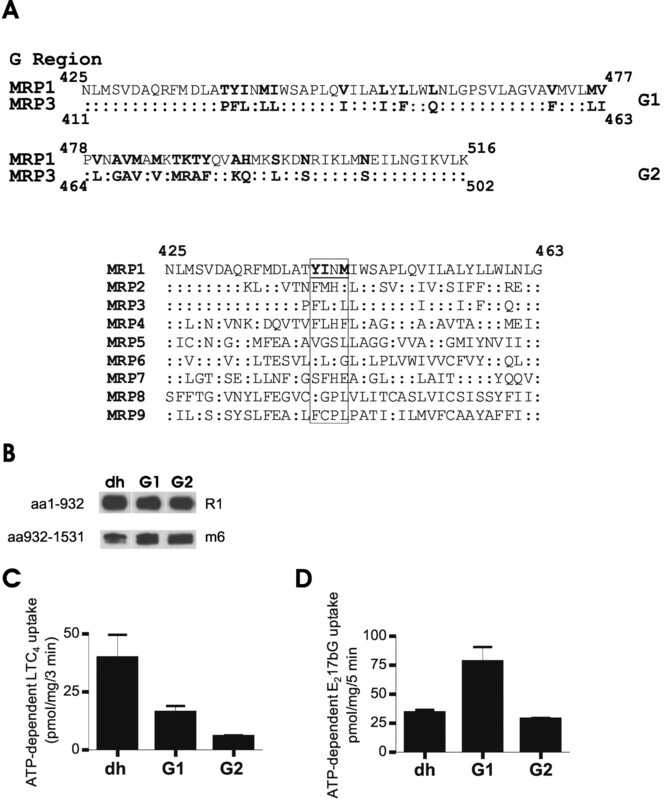 ATP-dependent uptake of [3H]-labeled LTC4,E217βG, E13SO4, and MTX by membrane vesicles prepared from Sf21 cells infected with virus encoding wild-type or mutant MRP1. A, levels of wild-type and mutant MRP1 proteins were determined by transferring vesicle protein to membranes using a slot blot apparatus, followed by sequential detection with mAbs QCRL1 and MRPm6 and densitometry, as described under Materials and Methods. Shown are scans of 1-μg samples only. Not shown are scans of the 0.5-, 1.5-, and 2-μg protein samples. The numbers below the blots refer to the levels of mutant MRP1 proteins relative to the level of the wild-type protein (dh), as determined by densitometry. B–E, ATP-dependent uptake of [3H]LTC4 measured for 2 min (B); [3H]E217βG measured for 3 min (C); [3H]E13SO4 measured with the addition of 2 mM S-methyl GSH for 1 min (D); and [3H]MTX measured for 20 min (E). The relative levels of protein expression determined by densitometry (A) were used to normalize transport data to the expression level of wild-type MRP1. Values are mean ± S.D. of three determinations in a single experiment. Similar results were obtained with two or more independently produced membrane vesicle preparations. Kinetic Parameters of [3H]LTC4 Transport by Y440F and I441L Single and Double Mutants. We also determined the effects of the Y440F and I441L single and double mutations on the Km and Vmax for LTC4 transport. The Km and Vmax values obtained for wild-type MRP1 were 72 nM and 37 pmol/mg/min, respectively, whereas the Km for the Y440F mutation was 328 nM and the normalized Vmax was 41 pmol/mg/min (Fig. 4, A and B). The increase in Km suggested that the relatively conservative substitution of Phe for Tyr results in an almost 5-fold decrease in apparent affinity for LTC4 with no change in the maximal rate of transport. Although LTC4 transport by the I441L mutant was only marginally decreased at a fixed concentration of substrate, linear regression analysis indicated that the Km for LTC4 was increased approximately 2-fold (149 nM for the I441L mutant protein versus 72 nM for wild-type MRP1), again with no significant change in Vmax (normalized Vmax for the I441L mutation 42 versus 37 pmol/mg/min for the wild-type protein) (Fig. 4, A and B). Transport of LTC4 by the double mutant was markedly reduced compared with either of the single mutations alone. As a consequence, it was technically impossible to determine an accurate Km for LTC4. Kinetic analysis of ATP-dependent [3H]LTC4 uptake by wild-type and mutant MRP1 proteins expressed in Sf21 cells. A, time course of ATP-dependent [3H]LTC4 uptake by membrane vesicles was measured at various LTC4 concentrations (25 nM to 1 μM) for 1 min at 23°C. B, Hanes-Wolff plot of the data shown in A. Shown are wild-type MRP1 (▪), Y440F (▴), I441L (▾), and Y440F/I441L (♦). Values are mean ± S.D. of triplicate determinations in single experiments. Kinetic parameters were determined from linear regression analysis of Hanes-Wolff plots of [S]/V versus [S]. Photolabeling of the NH2- and COOH-Terminal Halves of MRP1 Mutant Proteins by LTC4. To confirm whether the increase in Km resulting from the Y440F mutation reflected a decreased affinity for substrate, we examined the effect of the mutation on photolabeling of MRP1 with [3H]LTC4. Based on the expression levels of the three mutant proteins relative to wild-type MRP, the quantity of membrane vesicles used for photolabeling was adjusted to yield equivalent amounts of wild-type or mutant MRP1 in each photolabeled sample. To confirm that this was achieved, an aliquot of each protein sample used for photolabeling was re-examined by SDS-PAGE, immunoblotting, and densitometry (Fig. 5A). We have previously shown that LTC4 binds to both NH2- and COOH-terminal fragments of MRP1 asymmetrically (Qian et al., 2001a). As shown in Fig. 5B, [3H]LTC4 predominantly labels the NH2-terminal fragment containing amino acids 1 through 932 of wild-type MRP1, although labeling of the COOH-terminal fragment, amino acids 932 through 1531, was still readily detectable. Photolabeling of both fragments of the I441L mutant protein, which displayed only a 2-fold increase in Km, was essentially indistinguishable from that obtained with the wild-type MRP1 protein. However, photolabeling of the NH2-terminal fragments of both the Y440F and double Y440F/I441L mutant proteins was similarly, substantially reduced compared with both the wild-type and the I441L mutant. These data are consistent with the results of kinetic studies and strongly support the suggestion that theY440F mutation results in a substantial decrease in affinity for LTC4. Furthermore, photolabeling of the COOH-terminal fragment of the Y440F and Y440F/I441L mutant proteins was also reduced when compared with wild-type MRP1 or the I441L mutant, despite the fact that this region is identical in all four proteins. Thus, photolabeling of the NH2- and COOH-proximal halves of the protein does not seem to be the result of interaction of LTC4 with two functionally independent sites. [3H]LTC4 photolabeling of membrane vesicle isolated from Sf21 cells expressing wild-type and mutant MRP1 proteins. A, immunoblot showing the relative amounts of MRP1 protein in each sample after adjustment for relative MRP1 protein expression; wild-type MRP1 (35 μg) and mutants Y440F (75 μg), I441L (22 μg), and Y440F/I441L (20 μg). B, [3H]LTC4 photolabeling of wild-type and mutant MRP1 proteins. Each sample was adjusted to a total of 75 μg of protein with membrane vesicles from Sf21 cells expressing β-gus. The NH2- and COOH-proximal half-molecules are indicated as N- and C-half, respectively. The numbers below the blots refer to the levels of mutant MRP1 proteins relative to the level of the wild-type protein (dh), as determined by densitometry. Mutational Analysis of Residue Tyr440. We next examined the functional consequences of less conservative substitutions of Tyr440. These included nonaromatic neutral (Ala), polar (Ser), polar neutral (Gln), and acidic (Glu) residues, as well as a polar aromatic substitution with Trp. Vesicles containing the mutant proteins were then tested for their ability to transport LTC4. All of these mutations had a greater effect on transport than the more conservative Y440F mutation. Transport by the two polar mutations Y440Q and Y440S was decreased by 75 to 80%, whereas the charged and neutral mutations decreased transport by more than 90% (Fig. 6A). To determine whether the size of the aromatic side chain was critical, as well as its polarity, we created a Tyr to Trp mutation. This mutation decreased LTC4 transport by 75% compared with the wild-type protein (Fig. 6A). In addition, unlike the Y440F mutation, which had little effect on E217βG transport, the Y440W mutation essentially eliminated transport of the conjugated estrogen (Fig. 6B). Kinetic Parameters of S-Methyl GSH-Stimulated [3H]Estrone 3-Sulfate Transport and Azidophenacyl[35S]-GSH Photolabeling of Wild-Type and Mutant MRP1 Proteins. The Y440F mutation has a major deleterious effect on the transport of LTC4 and the S-methyl GSH-stimulated transport of E13SO4 (Fig. 3, B and D) but not on the other estrogen conjugate tested (E217βG) or MTX (Fig. 3, C and E). Because we have shown that the Y440F mutant protein has reduced affinity for LTC4 compared with wild-type MRP1 (Fig. 4B), it is possible that the Y440F mutation also affects the affinity for E13SO4 and/or S-methyl GSH. To test the former hypothesis, we attempted to determine a Km for the transport of E13SO4 by wild-type MRP1 and the Y440F mutant. It is unfortunate that the levels of transport by the mutant precluded determination of a reliable Km. However, the transport deficiency showed no indication of being overcome by using concentrations of E13SO4 as much as 10-fold higher than the Km of wild-type MRP1 in transport assays (Fig. 7A). Thus, although we were unable to determine whether Km was affected, it seems likely that the mutation decreases the Vmax for E13SO4 transport possibly as a result of decreasing the affinity for S-methyl GSH. ATP-dependent uptake of [3H]LTC4 and [3H]E217βG by Sf21 membrane vesicles containing wild-type and Tyr440 mutant MRP1 proteins. A, [3H]LTC4 uptake measured at 2 min. B, [3H]E217βG uptake measured at 3 min. Values were normalized to account for differences in MRP1 protein expression levels. Values are mean ± S.D. of three determinations in a single experiment. Similar results were obtained with two independently produced membrane vesicle preparations. To test whether the Y440F mutation alters the binding characteristics of S-methyl GSH and thus E13SO4 transport, we examined the binding of a GSH analog, azidophenacyl-GSH, to wild-type and mutant MRP1 expressed in stably transfected HEK cells. We have previously shown that this analog can substitute for GSH or S-methyl GSH in stimulating E13SO4 transport and, when radiolabeled with 35S, binds to MRP1 in a fashion similar to that found for LTC4 (Qian et al., 2002). The M443L mutation reduced S-methyl GSH-stimulated E13SO4 transport by 90% in Sf21 cells (Fig. 3D). As shown in Fig. 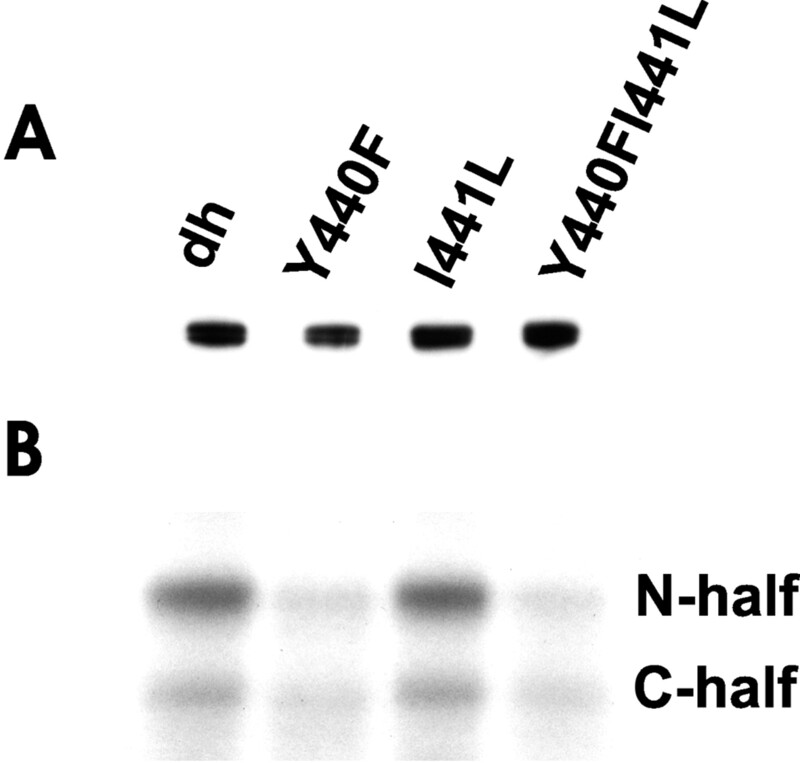 7, B and C, binding of azidophenacyl-[35S]GSH by this mutant protein was barely detectable when compared with wild-type MRP1, despite the use of almost 2-fold more mutant than wild-type protein in the samples shown. Thus, the affinity for azidophenacyl-GSH is severely affected by the M443L mutation. In contrast, the I441L mutant protein, which decreased S-methyl GSH-stimulated transport of E13SO4 by 55% compared with wild-type MRP1 (Fig. 3D), bound approximately equivalent levels of azidophenacyl-[35S]GSH (Fig. 7C), suggesting that, as was determined for LTC4, the affinity for azidophenacyl-GSH is relatively unaffected by the I441L mutation. In contrast, the Y440F mutation, which reduced S-methyl GSH-stimulated transport of E13SO4 by approximately 65% (Fig. 3D), markedly decreased photolabeling with azidophenacyl-[35S]GSH (Fig. 7C). This suggests that the affinity for this GSH derivative is dramatically affected by the Y440F mutation, as was found for LTC4. The reduced affinity for both azidophenacyl GSH and LTC4 suggests that the Y440F mutation may alter the interaction of MRP1 with the GSH moiety of both compounds and thus may decrease E13SO4 transport by reducing the affinity for GSH and S-methyl GSH. Effect of the Y440F, I441L, M443L, and Y440F/I441L Mutations on Resistance to Vincristine, Doxorubicin, and VP-16. Lastly, the drug-resistance profiles of Y440F, I441L, M443L, and Y440F/I441L mutant proteins were examined because unlike MRP1, the profile of resistance to natural product drugs conferred by MRP3 is restricted primarily to epipodophyllotoxins (Deeley et al., 2006). Each single and the double-mutant proteins were stably expressed in cloned populations of HEK293 cells, and the subcellular localization of wild-type and mutant MRP1s was compared by immunostaining with the MRP1-specific mAb MRPm6 and confocal microscopy to ensure that none of the mutations adversely affected protein trafficking (see supplemental data). S-Methyl GSH-enhanced ATP-dependent [3H]E13SO4 uptake and azidophenacyl-[35S]GSH photolabeling of wild-type and mutant MRP1 proteins. A, ATP-dependent [3H]E13SO4 uptake by membrane vesicles prepared from Sf21 cells was measured at various concentrations of [3H]E13SO4 (3–20 μM) in the presence of 2 mM S-methyl GSH. Uptake was measured after a 30-s incubation at 37°C. Data points are the mean ± S.D. of triplicate determinations in a single experiment, and uptake levels have been adjusted to compensate for differences in the relative levels of mutant proteins relative to wild-type MRP1. B and C, for photolabeling with azidophenacyl-[35S]GSH, membrane vesicles prepared from stably transfected HEK293 cells were incubated with azidophenacyl-[35S]GSH (0.3 μCi) and processed as described under Materials and Methods. For each sample, approximately 120 μg of total membrane protein was analyzed, but amounts of the specific membrane vesicle preparations were adjusted to compensate for the relative MRP1 protein expression by the addition of membrane vesicles isolated from HEK293 cells stably transfected with empty expression vector, PC7. B, the immunoblot analysis with mAb MRP1m6 of the proteins. The numbers below the blots refer to the levels of mutant MRP1 proteins relative to the level of the wild-type protein, as determined by densitometry. C, photolabeling of the remaining sample from B with azidophenacyl-[35S]GSH. Cells expressing MRP3 were significantly resistant to VP-16 (6.4-fold) but not to either vincristine (1.1-fold) or doxorubicin (0.87-fold), whereas cells expressing wild-type MRP1 were resistant to all three classes of drugs (15.6-, 16.2-, and 4.5-fold for vincristine, VP-16, and doxorubicin, respectively), consistent with previous results (Table 2) (Cole et al., 1994; Grant et al., 1994; Kool et al., 1999; Zelcer et al., 2001; Zhang et al., 2003). The three single mutations each decreased resistance to vincristine and VP-16, 2- to 3-fold, whereas only the Y440F mutation resulted in a major decrease in resistance to doxorubicin. The effect of the double Y440F/I441I mutation seemed to be additive with respect to both VP-16 and doxorubicin resistance but resulted in no greater decrease in resistance to vincristine than either mutation alone. Thus, as observed during organic anion transport studies, each mutation had different effects on the drug-resistance profile of MRP1, suggesting that all three of these residues contribute to recognition of natural product drugs, as well as the organic anion substrates tested. However, none of the mutations resulted in a profile more closely resembling that of MRP3. In studies described here, we sought to identify additional residues involved in the binding and transport of GSH and GSH conjugates by MRP1. We did so by constructing a series of MRP1/MRP3 hybrids and searching for regions that, when exchanged, decreased transport of the high-affinity MRP1 substrate, LTC4, without affecting transport of the shared substrate, E217βG. The approach was based on the premise that such regions would contain amino acids that differ between MRP1 and MRP3, which are determinants of LTC4 specificity. We found that it was possible to exchange most of MSD2, encompassing TMs 12 through 15, with little effect on LTC4 transport. This observation, together with previous studies showing that point mutations in TMs 16 and 17 have little effect on LTC4 transport by MRP1, suggested that nonidentical residues critical for LTC4 transport were localized in MSD1 and possibly the cytoplasmic linker region (CL3) (Deeley et al., 2006). The only hybrid that displayed a major, selective decrease in LTC4 transport contained amino acids 411 through 502 of MRP3 in place of amino acids 425 through 516 of MRP1. Exchange of this region, spanning TMs 8 and 9, completely eliminated LTC4 transport with little effect on transport of E217βG. Four amino acids in this region of MRP1 (Arg433, Asp436, Trp459, and Pro478) have previously been shown to be determinants of the substrate specificity of MRP1 (Conrad et al., 2002; Koike et al., 2002, 2004; Haimeur et al., 2004). Mutation of three of them (Arg433, Asp436, and Pro478) affects transport of LTC4. Arg433 and Asp436 are predicted to be located in a cytoplasmic helical region that is an extension of TM8, whereas Pro478 is located within TM9. However, all of these residues are identical between MRP1 and MRP3 and thus would not be revealed by the approach we have taken. The G region contains 26 amino acids that differ between MRP1 and MRP3. Analysis of hybrids containing subfragments spanning either TM 8 or TM 9 suggested that multiple nonidentical residues were likely to contribute to LTC4-specific transport. Consequently, we were unable to completely replicate the results of exchanging the entire region by mutating the 26 nonidentical amino acids singly or as clusters of up to eight residues. Furthermore, individual mutation of many of these residues had negligible effects on transport of any of the substrates tested. This result is consistent with current models of the interaction of multidrug transporters with their structurally diverse substrates, which is believed to involve multiple, often overlapping, weak interactions between the ligand and a relatively large and flexible binding pocket or surface (reviewed in Deeley and Cole, 2006). However, we did locate a trio of nonidentical amino acids predicted to be in the inner leaflet region of TM8, each of which selectively affected the substrate specificity of MRP1. It is noteworthy that conservative substitution of Tyr440 with Phe as present in MRP3 reduced LTC4 transport by ∼60% with little effect on transport of E217βG. This mutation also reduced transport of the GSH-dependent MRP1 substrate E13SO4 but not the unconjugated organic anion MTX, which is transported by both MRP1 and MRP3 (Deeley et al., 2006). 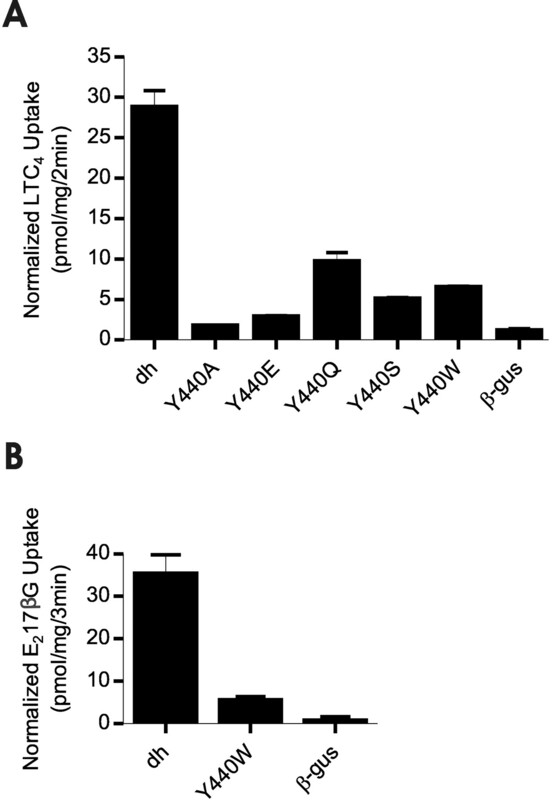 The Y440F mutation resulted in a significant decrease in the apparent affinity for LTC4 (4–5-fold increase in Km), whereas Vmax was not affected. In addition, photolabeling of the Y440F protein by [3H]LTC4 was markedly decreased. Taken together, the data strongly suggested that the primary defect in the Y440F protein was at the level of LTC4 binding. Sequence comparison with the human MRP family (Fig. 2A) revealed that seven of nine members have Tyr or Phe at the position corresponding to MRP1 Tyr440. Thus, the presence of an aromatic amino acid at this position is relatively highly conserved across family members and may be of broad functional importance for substrate recognition. In addition to MRP1, MRP6 and the more distantly related MRP4 have been shown to transport LTC4 with relatively high affinity (Iliás et al., 2002; Rius et al., 2008). However, whereas Tyr440 is conserved in MRP6, the corresponding residue in MRP4 is Phe, as it is in MRP3. The lack of complete conservation among the LTC4 transporters is not unexpected. Extensive studies have shown that structure/substrate specificity relationships cannot be predicted based on amino acid sequence conservation among MRP homologs, and that even exceptionally conserved amino acids do not necessarily make the same contributions to recognition of common substrates (reviewed in Deeley et al., 2006). Other conservative (W) and nonconservative (A, E, Q, and S) substitutions of Tyr440 caused significant reductions in LTC4 transport ranging from 75% (Y440Q) to 90% (Y440A and Y440E). In particular, the relatively conservative substitution with Trp not only decreased LTC4 transport by ∼75%, but unlike the Y440F mutation, also essentially eliminated transport of E217βG. Thus, it seems that both the size and the polarity of the aromatic side chain at this location are important for the interaction of MRP1 with LTC4, whereas it is primarily the size that is critical for interaction with E217βG. Whether the mutations exert their effects by altering direct contacts between substrate and the mutated residue or by localized perturbations in regions of the binding pocket important for interaction with certain substrates and not others is presently not known. In contrast to the Y440F mutation, the conservatively substituted I441L mutation had no effect on LTC4 or MTX transport but decreased transport of both E217βG and E13SO4, whereas the M443L mutation decreased transport of all three conjugated substrates but not MTX. Likewise, mutation of each of these three residues caused differential effects on the drug-resistance profile of MRP1, consistent with their importance in determining recognition and transport of a number of substrates in addition to LTC4. As suggested previously, these observations are compatible with the existence of a common binding pocket with each substrate establishing multiple overlapping but not identical interactions with the protein (Deeley et al., 2006). The figure illustrates three views of the model of MRP1 based on the crystal structure of the ADP bound form of S. aureus Sav1866 generated as previously described (DeGorter et al., 2008) and produced using PyMol (DeLano Scientific LLC, San Carlos, CA). The locations of residues in TMs 6 and 8 referred to in the text, which have been shown to selectively influence transport of LTC4, are indicated. A, view of MRP1 from the extracellular face of the membrane to illustrate the disposition of residue side chains relative to the putative translocation pore. B, view of MRP1 positioned to illustrate the tilt and curvature of TMs 6 and 8. C, view of MRP1 from the plane of the membrane illustrating the positions of TMs 6, 7, and 8 and coupling helix 1 in MSD1 (shown in pale purple), which links TMs 7 and 8 and sits at the interface between the two NBDs. The clustering of Tyr440, Ile441, and Met443 in a single turn of TM8 is similar to that of three previously identified mutation-sensitive residues in TM6: Lys332, His335, and Asp336. Mutations of Lys332 and His335 affect substrate specificity in a similar and selective fashion, whereas mutation of Asp336 affects overall transport activity (Haimeur et al., 2002, 2004). Most significantly, the conservative substitution of Lys332 by Arg increased the Km for LTC4 ∼5-fold without affecting the Vmax, as is the case with the Y440F mutation. Other nonconservative mutations of Lys332 abrogated LTC4 transport, as was observed with certain nonconservative substitutions of Tyr440. In addition, photolabeling with [3H]LTC4 of K332D and K332L mutant proteins was severely reduced compared with wild-type MRP1. 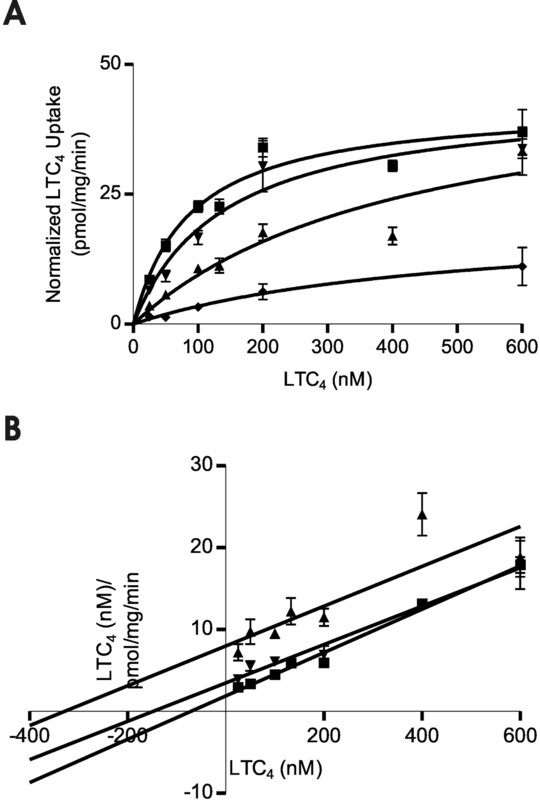 Thus, mutations of both TM6-Lys332 and TM8-Tyr440 decrease LTC4 binding, and both the charge (or polarity) and volume of the residue at either location are critical for interaction with LTC4. The Y440F mutation had little effect on either E217βG or MTX transport but markedly decreased S-methyl GSH-stimulated E13SO4 transport, and photolabeling with the GSH analog azidophenacyl-[35S]GSH was severely reduced. Because of the magnitude of the effect, we were unable to determine the kinetic parameters of E13SO4 transport. However, it is clear that the Y440F mutation almost entirely eliminates binding of azidophenacyl-GSH, as well as LTC4. Because both S-methyl GSH and azidophenacyl-GSH can substitute for GSH in transport of E13SO4 (Qian et al., 2002; Leslie et al., 2003), Tyr440 may interact with the GSH moiety of LTC4, S-methyl GSH, and azidophenacyl-GSH and thus reduce transport of both LTC4 and E13SO4. Consistent with this suggestion, the Y440F mutation resulted in a major decrease in resistance to all three classes of drugs, transport of, or resistance to which, has been shown to be GSH-dependent (Loe et al., 1996b, 1998; Rappa et al., 1997; Renes et al., 1999). We have previously used molecular modeling to examine possible spatial relationships among residues that affect the substrate specificity of MRP1, as well as the disposition of specific amino acid side chains with respect to the putative translocation pathway of the protein (Campbell et al., 2004; Deeley et al., 2006). The models of MRP1 and several other ABC transporters were based on the crystal structure of MsbA published by Chang (2003). This structure differs significantly from that determined more recently for the Staphylococcus aureus multidrug ABC transporter, Sav1866, and was retracted because of major errors in the packing and tilt of a number of TMs (Chang et al., 2006; Dawson and Locher, 2006; Dawson et al., 2007). Consequently, we developed a revised model based on the more recent Sav1866 structure (DeGorter et al., 2008). However, this structure corresponds to the ADP-trapped form of Sav1866, in which the protein is thought to be in its low-affinity substrate binding state, with the putative translocation pathway open to the extracellular side of the membrane. In such a configuration, it is presumed that the high-affinity site is occluded and inaccessible to substrate in the cytoplasm or membrane. Three views of this model are shown in Fig. 8, illustrating the predicted locations of residues in TM8, which when mutated selectively affect substrate specificity, in relation to those previously identified in TM6, which also differentially influence transport of LTC4. The TMs in the Sav1866-based structure are tilted relative to the likely translocation pathway, rather than being parallel to it, and several of the helices display significant curvature (Fig. 8B) (DeGorter et al., 2008). For example, TM6 and TM8 are adjacent to each other and closely aligned in the inner leaflet region of the membrane but tilt away from each other in the outer leaflet. The cluster of residues we have identified is located in the inner leaflet of the membrane with the side chains of Tyr440and Ile441 aligned tangentially to the translocation pathway, whereas Met443 projects into it. In TM6, the previously identified residues are predicted to be located in the outer leaflet, with Lys332 and Asp336 projecting into the “open” end of the pathway. It has been proposed that changes in the conformation of the NBDs on binding and release of nucleotide are transmitted to the MSDs via two coupling helices in each MSD, one of which (helix 1) interacts with both NBDs in the closed configuration, whereas the other (helix 2) interacts with the apposing NBD. In MSD1 of MRP1, coupling helix 1 is predicted to connect TM7 and TM8. Thus, one or both of these helices seem likely candidates for transmitting conformational changes induced by movement of coupling helix 1. It remains to be determined to what extent such a conformational change affects the accessibility of the residues in TM8, such as Tyr440 and Ile441, to hydrophilic substrates such as LTC4 and GSH. We thank Heng-Ran Cui, Ruth Burtch-Wright, and Monika Vasa for excellent technical assistance. This work was supported by a grant from the Canadian Institutes of Health Research (MOP-62824). ABBREVIATIONS: ABC, ATP-binding cassette; MRP, multidrug resistance protein; GSH, glutathione; LTC4, cysteinyl leukotriene C4; E217βG, estradiol-17β-d-glucuronide; E13SO4, estrone 3-sulfate; MTX, methotrexate; VP-16, etoposide; MSD, membrane-spanning domain; TM, transmembrane; NBD, nucleotide-binding domain; SUR, sulfonylurea receptor; HEK, human embryonic kidney; β-gus, β-glucuronidase; PCR, polymerase chain reaction; PAGE, polyacrylamide gel electrophoresis; mAb, monoclonal antibody. The online version of this article (available at http://dmd.aspetjournals.org) contains supplemental material. ↵1 Current affiliation: Gene Expression and Protein Biochemistry, Pharmaceutical Research Institute, Bristol-Myers Squibb Company, Princeton, New Jersey. ↵2 Current affiliation: University of Western Ontario, London, Ontario, Canada. Bakos E, Evers R, Szakács G, Tusnády GE, Welker E, Szabó K, de Haas M, van Deemter L, Borst P, Váradi A, et al. (1998) Functional multidrug resistance protein (MRP1) lacking the N-terminal transmembrane domain. J Biol Chem 273: 32167-32175. Campbell JD, Koike K, Moreau C, Sansom MS, Deeley RG, and Cole SPC (2004) Molecular modeling correctly predicts the functional importance of Phe594 in transmembrane helix 11 of the multidrug resistance protein, MRP1 (ABCC1). J Biol Chem 279: 463-468. Chang G (2003) Structure of MsbA from Vibrio cholera: a multidrug resistance ABC transporter homolog in a closed conformation. J Mol Biol 330: 419-430. [Retraction in Chang G (2007) J Mol Biol 369:596]. Chang G, Roth CB, Reyes CL, Pornillos O, Chen Y-J, and Chen AP (2006) Retraction. Science 314: 18756. Cole SP, Bhardwaj G, Gerlach JH, Mackie JE, Grant CE, Almquist KC, Stewart AJ, Kurz EU, Duncan AM, and Deeley RG (1992) Overexpression of a transporter gene in a multidrug-resistant human lung cancer cell line. Science 258: 1650-1654. Cole SP, Sparks KE, Fraser K, Loe DW, Grant CE, Wilson GM, and Deeley RG (1994) Pharmacological characterization of multidrug resistant MRP-transfected human tumor cells. Cancer Res 54: 5902-5910. Conrad S, Kauffmann HM, Ito K, Leslie EM, Deeley RG, Schrenk D, and Cole SPC (2002) A naturally occurring mutation in MRP1 results in a selective decrease in organic anion transport and in increased doxorubicin resistance. Pharmacogenetics 12: 321-330. Dawson RJ, Hollenstein K, and Locher KP (2007) Uptake or extrusion: crystal structures of full ABC transporters suggest a common mechanism. Mol Microbiol 65: 250-257. Dawson RJ and Locher KP (2006) Structure of a bacterial multidrug ABC transporter. Nature 443: 180-185. Deeley RG and Cole SP (2006) Substrate recognition and transport by multidrug resistance protein 1 (ABCC1) FEBS Lett 580: 1103-1111. Deeley RG, Westlake C, and Cole SPC (2006) Transmembrane transport of endo- and xenobiotics by mammalian ATP-binding cassette multidrug resistance proteins. Physiol Rev 86: 849-899. DeGorter MK, Conseil G, Deeley RG, Campbell RL, and Cole SPC (2008) Molecular modeling of the human multidrug resistance protein 1 (MRP1/ABCC1). Biochem Biophys Res Commun 365: 29-34. Gao M, Cui HR, Loe DW, Grant CE, Almquist KC, Cole SP, and Deeley RG (2000) Comparison of the functional characteristics of the nucleotide binding domains of multidrug resistance protein 1. J Biol Chem 275: 13098-13108. Gao M, Loe DW, Grant CE, Cole SP, and Deeley RG (1996) Reconstitution of ATP-dependent leukotriene C4 transport by co-expression of both half-molecules of human multidrug resistance protein in insect cells. J Biol Chem 271: 27782-27787. Grant CE, Valdimarsson G, Hipfner DR, Almquist KC, Cole SP, and Deeley RG (1994) Overexpression of multidrug resistance-associated protein (MRP) increases resistance to natural product drugs. Cancer Res 54: 357-361. Haimeur A, Conseil G, Deeley RG, and Cole SPC (2004) Mutations of charged amino acids in or near the transmembrane helices of the second membrane spanning domain differentially affect the substrate specificity and transport activity of the multidrug resistance protein MRP1 (ABCC1). Mol Pharmacol 65: 1375-1385. Haimeur A, Deeley RG, and Cole SPC (2002) Charged amino acids in the sixth transmembrane helix of multidrug resistance protein 1 (MRP1/ABCC1) are critical determinants of transport activity. J Biol Chem 277: 41326-41333. Hipfner DR, Almquist KC, Stride BD, Deeley RG, and Cole SPC (1996) Location of a protease-hypersensitive region in the multidrug resistance protein (MRP) by mapping of the epitope of MRP-specific monoclonal antibody QCRL-1. Cancer Res 56: 3307-3314. Hirohashi T, Suzuki H, Takikawa H, and Sugiyama Y (2000) ATP-dependent transport of bile salts by rat multidrug resistance-associated protein 3 (Mrp3). J Biol Chem 275: 2905-2910. Hooijberg JH, Broxterman HJ, Kool M, Assaraf YG, Peters GJ, Noordhuis P, Scheper RJ, Borst P, Pinedo HM, and Jansen G (1999) Antifolate resistance mediated by the multidrug resistance proteins MRP1 and MRP2. Cancer Res 59: 2532-2535. Iliás A, Urbán Z, Seidl TL, Le Saux O, Sinkó E, Boyd CD, Sarkadi B, and Váradi A (2002) Loss of ATP-dependent transport activity in pseudoxanthoma elasticum-associated mutants of human ABCC6 (MRP6). J Biol Chem 277: 16860-16867. Koike K, Conseil G, Leslie EM, Deeley RG, and Cole SPC (2004) Identification of proline residues in the core cytoplasmic and transmembrane regions of multidrug resistance protein 1 (MRP1/ABCC1) important for transport function, substrate specificity, and nucleotide interactions. J Biol Chem 279: 12325-12336. Koike K, Oleschuk CJ, Haimeur A, Olsen SL, Deeley RG, and Cole SPC (2002) Multiple membrane-associated tryptophan residues contribute to the transport activity and substrate specificity of the human multidrug resistance protein, MRP1. J Biol Chem 277: 49495-49503. Kool M, van der Linden M, de Haas M, Scheffer G, de Vree JM, Smith AJ, Jansen G, Peters GJ, Ponne N, Scheper R, et al. (1999) MRP3, an organic anion transporter able to transport anti-cancer drugs. Proc Natl Acad Sci U S A 96: 6914-6919. Leier I, Jedlitschky G, Buchholz U, Center M, Cole SP, Deeley RG, and Keppler D (1996) ATP-dependent glutathione disulphide transport mediated by the MRP gene-encoded conjugate pump. Biochem J 314: 433-437. Leier I, Jedlitschky G, Buchholz U, Cole SP, Deeley RG, and Keppler D (1994) The MRP gene encodes an ATP-dependent export pump for leukotriene C4 and structurally related conjugates. J Biol Chem 269: 27807-27810. Leslie EM, Bowers RJ, Deeley RG, and Cole SPC (2003) Structural requirements for functional interaction of glutathione tripeptide analogs with the human multidrug resistance protein 1 (MRP1). J Pharmacol Exp Ther 304: 643-653. Loe DW, Almquist KC, Cole SP, and Deeley RG (1996a) ATP-dependent 17 β-Estradiol 17-(β-D-glucuronide) transport by multidrug resistance protein (MRP). Inhibition by cholestatic steroids. J Biol Chem 271: 9683-9689. Loe DW, Almquist KC, Deeley RG, and Cole SPC (1996b) Multidrug resistance protein (MRP)-mediated transport of leukotriene C4 and chemotherapeutic agents in membrane vesicles. Demonstration of glutathione-dependent vincristine transport. J Biol Chem 271: 9675-9682. Loe DW, Deeley RG, and Cole SPC (1998) Characterization of vincristine transport by the M(r) 190,000 multidrug resistance protein (MRP): evidence for co-transport with reduced glutathione. Cancer Res 58: 5130-5136. Qian YM, Grant CE, Westlake CJ, Zhang DW, Lander PA, Shepard RL, Dantzig AH, Cole SP, and Deeley RG (2002) Photolabeling of human and murine multidrug resistance protein 1 with the high affinity inhibitor [125I]LY475776 and azidophenacyl-[35S]glutathione. J Biol Chem 277: 35225-35231. Qian YM, Qiu W, Gao M, Westlake CJ, Cole SP, and Deeley RG (2001a) Characterization of binding of leukotriene C4 by human multidrug resistance protein 1: evidence of differential interactions with NH2- and COOH-proximal halves of the protein. J Biol Chem 276: 38636-38644. Qian YM, Song WC, Cui H, Cole SP, and Deeley RG (2001b) Glutathione stimulates sulfated estrogen transport by multidrug resistance protein 1. J Biol Chem 276: 6404-6411. Rappa G, Lorico A, Flavell RA, and Sartorelli AC (1997) Evidence that the multidrug resistance protein (MRP) functions as a co-transporter of glutathione and natural product toxins. Cancer Res 57: 5232-5237. Renes J, de Vries EG, Nienhuis EF, Jansen PL, and Müller M (1999) ATP- and glutathione-dependent transport of chemotherapeutic drugs by the multidrug resistance protein MRP1. Br J Pharmacol 126: 681-688. Rius M, Hummel-Eisenbeiss J, and Keppler D (2008) ATP-dependent transport of leukotrienes B4 and C4 by the multidrug resistance protein ABCC4 (MRP4). J Pharmacol Exp Ther 324: 86-94. Sakamoto H, Hara H, Hirano K, and Adachi T (1999) Enhancement of glucuronosyl etoposide transport by glutathione in multidrug resistance-associated protein-overexpressing cells. Cancer Lett 135: 113-119. Westlake CJ, Qian YM, Gao M, Vasa M, Cole SP, and Deeley RG (2003) Identification of the structural and functional boundaries of the multidrug resistance protein 1 cytoplasmic loop 3. Biochemistry 42: 14099-14113. Zelcer N, Reid G, Wielinga P, Kuil A, van der Heijden I, Schuetz JD, and Borst P (2003) Steroid and bile acid conjugates are substrates of human multidrug-resistance protein (MRP) 4 (ATP-binding cassette C4). Biochem J 371: 361-367. Zelcer N, Saeki T, Reid G, Beijnen JH, and Borst P (2001) Characterization of drug transport by the human multidrug resistance protein 3 (ABCC3). J Biol Chem 276: 46400-46407. Zeng H, Liu G, Rea PA, and Kruh GD (2000) Transport of amphipathic anions by multidrug resistance protein 3. Cancer Res 60: 4779-4784. Zhang DW, Gu HM, Vasa M, Muredda M, Cole SP, and Deeley RG (2003) Characterization of the role of polar amino acid residues within predicted transmembrane helix 17 in determining the substrate specificity of multidrug resistance protein 3. Biochemistry 42: 9989-10000.